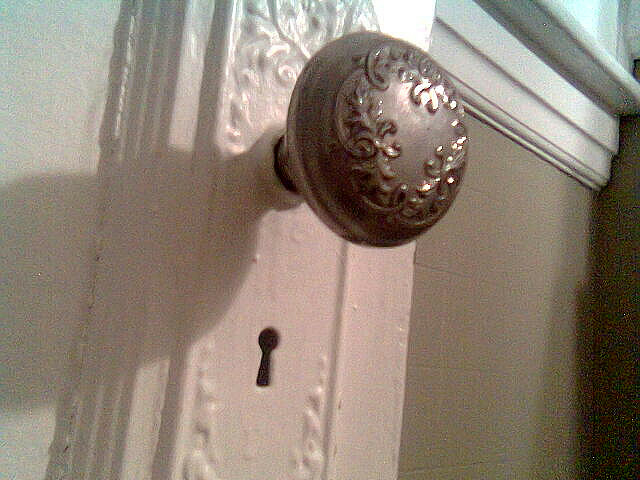 I gripped the slippery doorknob with both hands, twisted, pushed hard and stepped over the threshold. It was silent, as I’d known it would be. Not even the ticking of a clock disturbed the stillness. And it was warm—the kind of warmth in which I could imagine a cat snoozing contentedly on the windowsill. Sunlight radiated through the sheer fabric of the curtains and settled on my back as I turned to gaze around. This was the small front parlour of the house, rarely used but showing every sign of being well cared for. The light reflecting from the inlaid wooden table revealed no dust, just a clean satin surface. In this room were displayed my grandmother’s best examples of handiwork—the embroidered firescreen, the framed tapestries and felt appliqué pictures. Here, too, were the best plates and teacups, locked away in a glass-fronted cabinet, safe from curious-fingered children. It was an older, calmer, more ordered world than I could have found anywhere else. I breathed in the drowsy air and moved forward. The piano—that’s what I’d really come for. I sat on the stool, my feet barely reaching the pedals, and broke the silence with a first few tentative notes. Until the call came for tea, time would be of no consequence. Playing the piano at my grandma’s house was always special. We had a rackety old instrument at home, but it was in the living-room, competing for air-time with the television, two parents, a brother and a sister. It was also backed up against the wall shared by our neighbours’ house, and I’d been made aware that they were not so fond of ‘The Ash Grove’ that they wished to hear it in stumbling rehearsal every night of the week. Between the ages of 18 and 38, I had regular access to a piano for only two years. It was in a rented house that I shared in my early 20s with two friends, both more accomplished performers than I was. By this time, I was mangling Mozart, Debussy and Fauré, and I judged it best to do so mainly while my friends were out. Now, at last, I’m properly grown up, with my own home and my own piano. Luckily for my neighbours, it stands against a thick stone wall that adjoins their garden shed, not their living-room. I now own my grandma’s old piano stool; one of her tapestries hangs on my mother’s wall, along with one felt appliqué picture; the rest of the furniture from the small front parlour is who-knows-where. I’m unlikely ever to enter that room again—but whenever I sit down alone to play, I cross a threshold into the same calm and ordered world. And in this place, an audience of one is quite enough. This entry was posted in Music and tagged grandmother's house, music, piano, stillness. Bookmark the permalink. I can relate – Im a music teacher and my mum gave me her piano when she downsized. I love just sitting down to play, although I, not sure my neighbours do! Lovely post! Thanks! Music ‘s very therapeutic, I think. It doesn’t matter how well you can play, as long as you enjoy it. Must feel good to play for you and just for you. Came over from Suzie’s blog party. Welcome! The party’s a great idea. I really enjoy playing just for fun. Thanks for liking and following!